The bleeding of the nose, or epistaxis, in children is a common and habitual ailment that can seem a little violent, since the bleeds can be strong and constant, but that really does not have to suppose a risk or illness in the person who suffers. There are people whose physical characteristics are more likely to suffering nose bleeds and this occurs especially in children in their growth stage. The reasons for these bleeding are very variable and we will know them in this article, in which we will also explain how to stop the nose bleeding in a child step by step. Placement of objects or fingers in the nose: In childhood, a habitual behavior is to shake the nose when you notice the existence of a foreign element, which can cause injuries in the area and irritation. In addition, another common behavior among children is the placement of objects or external elements in the nostrils, which can lead to an obstruction of the respiratory tract and damage the skin of the area. Irritations caused by colds or allergies: The walls of the nose are formed by a mucous cell tissue that can be irritated and create small wounds that bleed. As it is an area with many small veins that can be broken with the irritations generated by the existence of solid mucus or the force of the circulating air when sneeze. It is one of the most frequent reasons for nosebleeds. Injuries and blows: Another aspect to take into account are the traumas or blows that the child or girl may have received while playing or in a fall. It is normal to hit the nose with blood in the face or head, as it creates a small internal hemorrhage. It is important that if the blow has been strong, immediately go to a doctor so you can analyze the possible collateral damage of the blow. Air conditioners or hot air: It creates environmental dryness and breathes air that contains no moisture, can generate irritation and generate small cuts in the respiratory system, because the body cannot generate mucus to protect the nasal cavity of small external elements, such as dust particles or pollen. 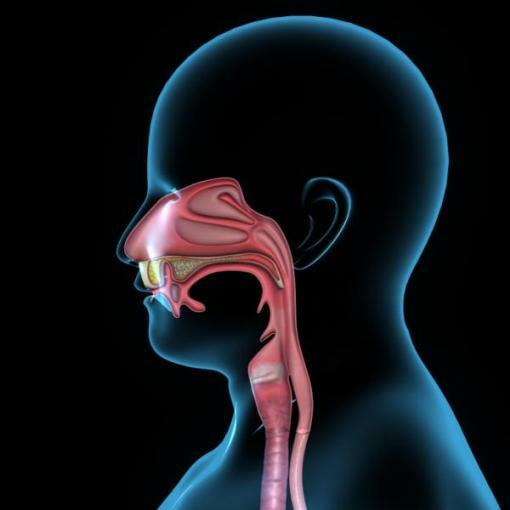 Malformations of the area: Like the deviated septum, a small protuberance, etc. Any malformation that is generated in the growth stage can cause bleeding in the nose, as it can scratch the walls of the nasal cavity. Nasal polyps: Polyps are lumps created by masses of fleshy tissue in the mucous membranes. They are not harmful to health or malignant and grow slowly. Depending on their size, they must be removed from the body or they may be absorbed by the mucosa itself. These polyps can generate irritations caused by a constant rubbing that can involve common bleeds. Diseases that involve the application of medicines or materials through the nose: People who suffer from other diseases and need the application of objects or medications on a daily or regular basis through the nose, may suffer the consequences of this application with injuries in the area that creates bleeds. In the first place, it is important that you stay calm. 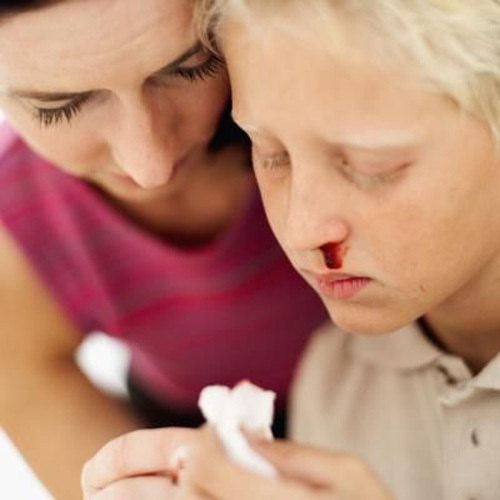 Nosebleeds in children can be a bit violent because a lot of blood can come out because it is an area where many blood vessels converge. This fact does not turn the bleeding into something dangerous by itself, it will depend on what is its cause what will indicate the degree of danger. To continue with the care of the child, from a calm, relaxed and safe attitude, we must make the child sit on a chair, bench or surface and put his head forward so that the blood can flow out. We should never stretch the child or ask him to put his head back, as it could cause an obstruction of the respiratory tract. Use your thumb and index finger and place them over the bottom of the child’s nose, pinching the nostrils. Ask the infant to breathe through the mouth. With this pressure, we are able to stop the bleeding, since the pressure exerted on the damaged blood vessel allows it to clog with its own blood and the platelets can stop the hemorrhage. Hold the pressure for 10 minutes and then release nose. In the event that the bleeding continues, repeat the operation performed. Refresh the child, putting water on the back of his neck, in his hands and gently washing his face. Once the hemorrhage is stopped, it is important that the child does not perform activities that require a great physical effort, since the loss of blood can weaken him and an overexertion could re-damage the nasal tissue. Some tips that we give you is that you perform the above operation using a tissue so as not to stain and so that the blood is not so visible. You can also use distracting resources during the ten minutes in which you will hold the child’s nose. Telling a story or playing a mental game can distract the child and allow him to relax before the impression of bleeding. When should I go to the doctor for a nosebleed in a child? In the case of not being able to stop the nasal bleeding after applying three times the pressure in the nasal cavity of the infant, that is, if more than 30 minutes have passed and the bleeding does not stop, you should go to the doctor to analyze the case. You should also visit the pediatrician if you suspect that there is an external element in the child’s nasal cavity, since the professional must perform its extraction with care and guarantees of success. If the bleeding is due to a blow or trauma to the head area, it is important that you go to the doctor, since the internal damages that can be caused by the blows are not immediately visible. It is also advisable to go to the doctor if the boy or girl who has suffered the hemorrhage begins to feel dizzy or faints, just as if it is a disease that suffers in a very common way.